Miri lives on a mountain where, for generations, her ancestors have quarried stone and lived a simple life. Then word comes that the king's priests have divined her small village the home of the future princess. In a year's time, the prince himself will come and choose his bride from among the girls of the village. The king's ministers set up an academy on the mountain, and every teenage girl must attend and learn how to become a princess. Miri soon finds herself confronted with a harsh academy mistress, bitter competition among the girls, and her own conflicting desires to be chosen and win the heart of her childhood best friend. 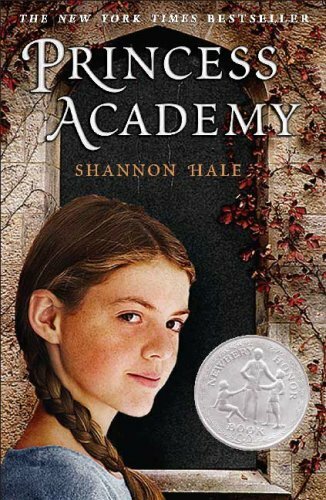 But when bandits seek out the academy to kidnap the future princess, Miri must rally the girls together and use a power unique to the mountain dwellers to save herself and her classmates. So, girls, how many of you have dreamt of being a princess at least once in your life? I know I have, many, many times in my day. Which is why I really liked this book. I read this book while my mom was getting her mani/pedi done, and I had nothing else to do but twiddle my thumbs and stare into space. And then I remembered that I had brought a book with me and pulled it out. I finished it that day, just before my mom’s nails finished drying. That’s how much I liked it. Admittedly, it’s more of a younger girl book, but teenage girls will love it as well. (I should know, I am one.) It was a story of survival and wit, and finding your heart’s true love. A very cute story, and very well written. Shannon Hale is absolutely one of my favorite authors.